In two prior races, V. I. P. Code had no answers for Still Having Fun, finishing a combined 16-plus lengths behind that rival. But today at Laurel Park in the $100,000 Private Terms for three-year-olds, V. I. P. Code had all the answers in a 36-1 upset. Under jockey Carlos Quinones, V. I. P. Code was never far off the pace, came three wide to lodge a bid against Forest Fire, and inched away from that rival to win by three parts of a length. It was the Phil Schoenthal trainee’s first career stakes win in his fifth added money try. Forest Fire held second, and 61-1 Dynamic Asset was third. Still Having Fun, the 3-5 favorite off wins in the Miracle Wood and Whiteley Stakes, was fourth. 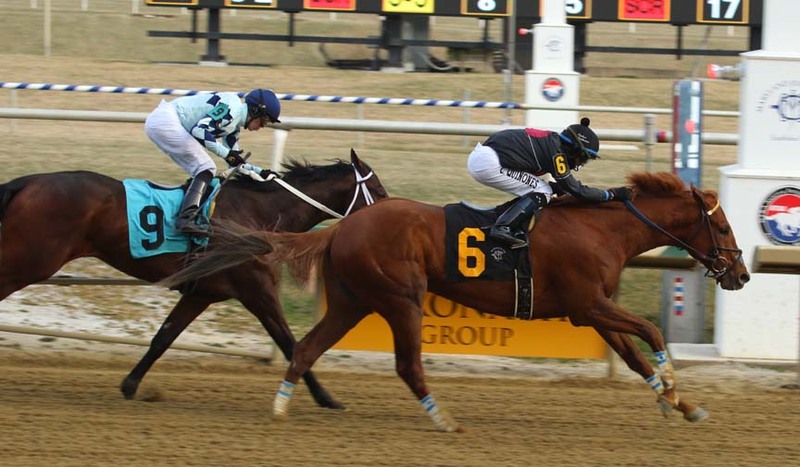 V. I. P. Code will likely race next in the Federico Tesio Stakes at Laurel Park April 21. Running time for the about 1 1/16 miles was 1:44.62. “When a horse is undefeated and doing good, you believe he’s going to come over here and run his race every time. When they throw you a bad race and punch you in the gut, it’s hard to show up and feel like you’re confident. But I felt like he belonged with these horses. “At the eighth pole I’m screaming my head off and thinking he might actually hang on to this thing. I had an absolutely dream trip, couldn’t have asked for a better ride.